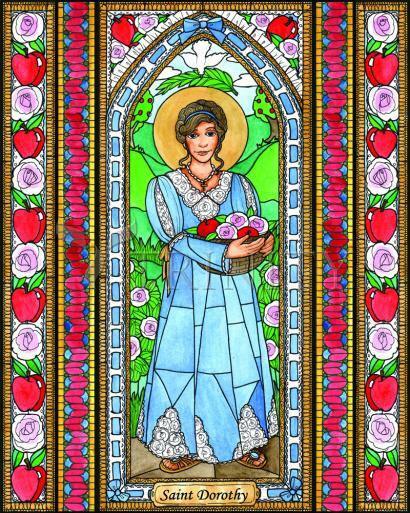 Saint Dorothy lived in the Third Century. We don't know much about her, except that she was a Christian during the persecution when the emperor Diocletian had outlawed Christianity. Dorothy refused to sacrifice to false Romans gods, so she was sent to be tortured and put to death. People gathered beside the path that the prisoners were dragged along, to mock them and jeer at them. A pagan lawyer named Theophilus, yelled out to Dorothy, making fun of her Christian beliefs by saying “Hey! Send me some fruit and flowers from the Heavenly garden when you get there.” Later after Dorothy was put to death, the lawyer was approached by a small child who looked like an angel. He gave Theophilus a basket of roses and apples, both of which were out of season and couldn't be bought at that time. Theophilus was shocked and then became a Christian himself, Dorothy's gift was all the proof he needed. Later Theophilus was also killed for being a Christian, but he didn't mind because he knew he would soon be joining Dorothy in Heaven’s Garden. Her feast day is February 6. St. Dorothy was a young, beautiful girl, who lived in the city of Caesarea, in Cappadocia, in Asia Minor. Theophilus, a rich and handsome young pagan, fell in love with Dorothy and wished to marry her, but she refused, saying, "Theophilus, I cannot marry you, because you are a pagan. If you will first learn about Jesus Christ and become a Christian, then I will marry you, if it is God's Holy will." This angered Theophilus very much and he thought, "I will get back at Dorothy for not wanting to marry me. I will tell Fabritius, the Governor of Caesarea that she will not marry me or sacrifice to the idols, because she is a Christian!" Before long, The Governor's guards were at Dorothy's house. They seized her and almost dragged her, so rude were they, and they threw her into a dirty old dungeon. One guard said, "Stay here and suffer for a while. Tomorrow you will stand before the Governor – maybe you will change your mind by then? Ha! Ha! Ha!" and he laughed his way out the door. Poor Dorothy sat there on the dungeon floor. A rat scurried across the floor and she jumped, as it brushed by her foot. Then she knelt and prayed, "My Jesus, my beloved, I put all my hopes and trust in Thee. Please help me to be faithful to martyrdom, if such be they Holy Will, and please dear Holy Ghost, enlighten me as to what I must say when I stand before the Governor." The next day, Dorothy was brought before the Governor, and he asked her, "Who are you?" To this the young girl replied, "I am Dorothy, a virgin and a servant of Jesus Christ." "You must serve our gods or die," cried Fabritius. Dorothy answered meekly, "Be it so; then the sooner I shall stand in the presence of Him, whom I most desire to behold." "What do you mean?" questioned the Governor. She replied, "I mean the Son of God, Jesus Christ, my spouse! His dwelling is in Paradise. By His side are eternal joys, and in His garden grow celestial fruits and roses that never fade!" Fabritius was much surprised at Dorothy's answer and instead of killing her; he had her taken back to the dungeon. Then, in order to make her give up her Catholic Faith, he sent her two women, named, Calista and Christeta, who were sisters, and who had once been Christians, but who had given up the Catholic Faith. They had been threatened with terrible torments and were afraid, and that is why they had given up their Catholic Faith. But they should not have done so – they should have trusted in Jesus who would give them strength to bear all their trials and pains. The Governor had promised them a large reward if they would persuade Dorothy to deny her Catholic Faith, as they had done. The two sisters boldly entered the dungeon where Dorothy was, and Calista said, "Dorothy, you really don't believe all that Catholic foolishness, do you? Come now, be an intelligent girl and follow us, and all will be fine!" Then Dorothy retorted, "You mean – follow you to Hell!" "There's no such place as Hell – it's only a story to scare people!" put in Christeta. Dorothy prayed. She knew that she would need the help of Jesus and Mary to convert these two women. As she talked, she found out that these two women were Catholics at one time. So Dorothy encouraged them, "Do you think that I would not do the same as you if I did not trust in Jesus? God is so powerful. It is for reasons so weak that you have both given up the Catholic Faith. But come now, if you pray with me, I believe that Jesus will grant you the gift of Faith again, and then you can go to Heaven too." Calista and Christeta resisted and argued at first, but Dorothy was kind and patient and she asked the Guardian Angels of the two women to help them come back to the Faith. Before long, the two women were weeping and begging God to forgive them for leaving the Faith. They realized what a terrible mistake they had made and cried, "O blessed Dorothy, pray for us that our cowardly sin may be forgiven by God and that He will accept our penance." "That, I will most certainly do!" Dorothy answered. "And be sure that my prayers are with you, so that you may go straight to Heaven!" Then the two sisters left the dungeon and cried, "We are Christians! We belong to Jesus Christ the true God, and we will follow Him to our death!" The Governor was furious! "Calista and Christeta – you dare to go against me and the gods," he screamed. "For this you will burn. I command you guards to burn these two women and I also command you to bring Dorothy, to watch them burn – maybe then, she will change her mind!" Dorothy was dragged out of the dungeon and thrown before Fabritius. "Do you see what will become of you? I will burn you like these two women." Dorothy could see the fire burning the women and the smoke going up their noses, "O my friends, fear not! Suffer bravely to the end! These short pains will be followed by eternal joys! Heaven will soon be yours!" Thus encouraged, the women died and Dorothy was sentenced, "You will be cruelly tortured and then have your head chopped off!" the Governor cried. Now Theophilus had been standing in the courtroom while the Governor had been questioning Dorothy. And when Theophilus saw Dorothy being lead to the torture chamber; he sneered, "Ha, fair maiden! So now you're going to meet Jesus, your bridegroom! Send me some of the apples and roses from His garden!" "I will send you the apples and roses and I will wait for you in the garden from which they came," Dorothy said, and before long she was beheaded. Then after her death, an angel appeared with a basket in which were three apples and three roses. Theophilus ate the apples and was converted. Then he too, died as a martyr, and went to meet St. Dorothy in the Heavenly garden.